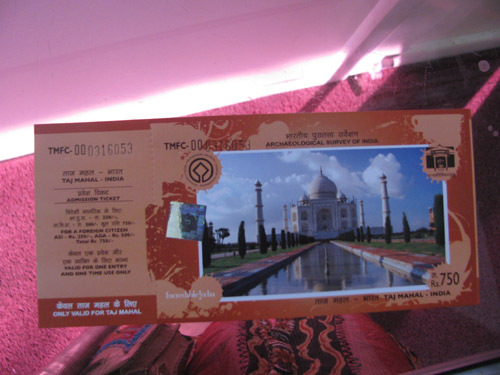 Finally, the day for my Taj Mahal visit arrived. I was so excited! I had wanted to see it ever since I learned about it as a child. First you buy a ticket, which comes with a bottle of water and a pair of disposable shoe covers. Then a shuttle takes tourists within one short block of the entrance gate. You run the gauntlet of touts, but the shopkeepers mostly let you pass unhindered. 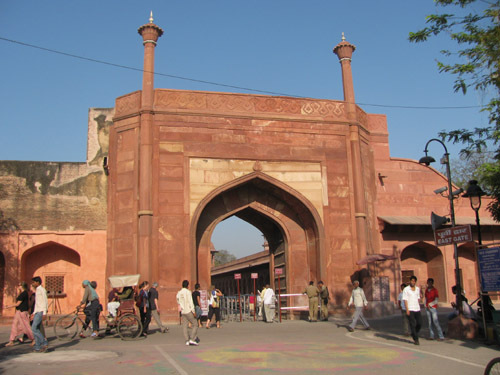 Entrance gate to the grounds of the Taj Mahal. 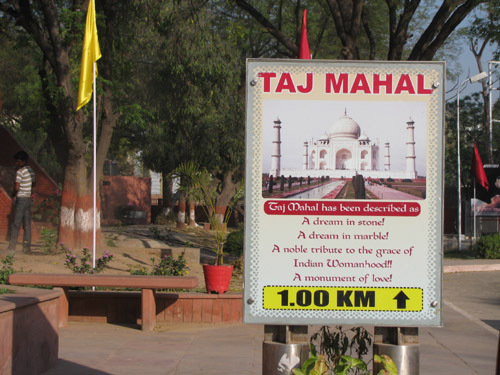 After passing through security, you are then on the grounds of the Taj Mahal complex. 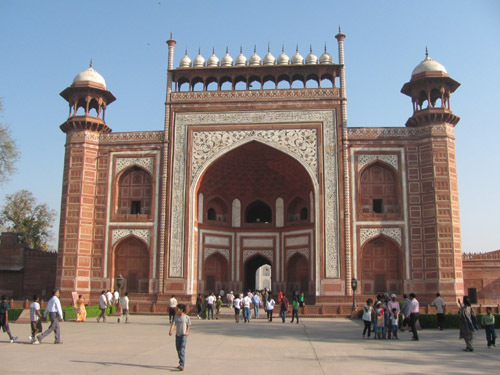 One more gate to pass through, but the white marble of the Taj can be seen peeking through the archway. Hundred of visitors were filing through the archway, many of them taking pictures first. The morning was a bit hazy, but the first glimpse was still powerful. I arrived early in the morning. 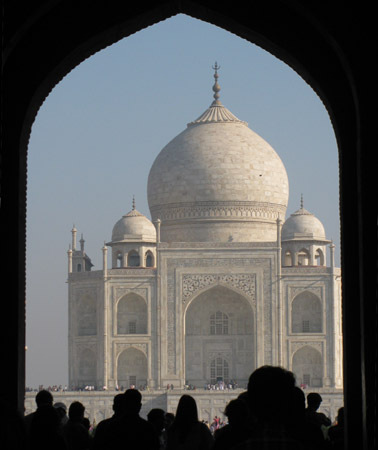 The straight-on view of the Taj Mahal may be a cliché, but nevertheless it’s the most flattering and beautiful. Unlucky for me, the reflecting pool had been drained. 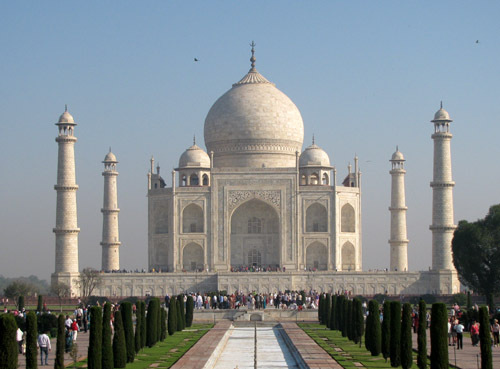 The story of the Taj Mahal is not exclusively a love story. 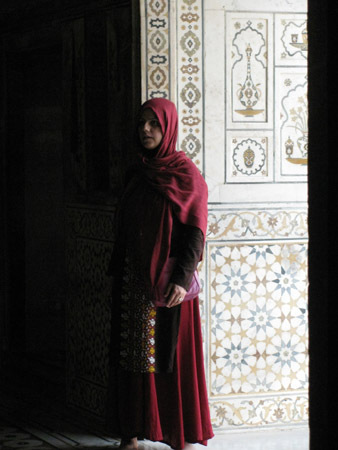 Mumtaz, for whom Shah Jahan commissioned its construction, was not his only wife, but his third. Just because she was his favorite did not mean he gave up sexual relations with his other two wives or dozens of concubines. 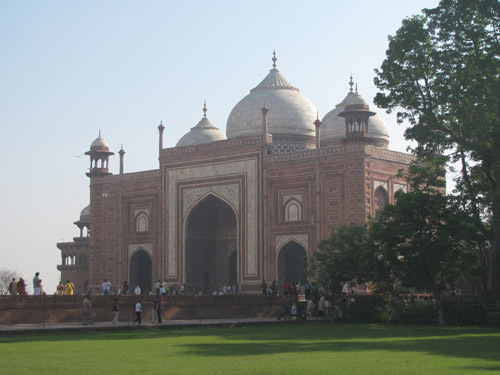 The Taj Mahal is flanked by two identical buildings, just as at the tomb of Itmad ud Daulah. 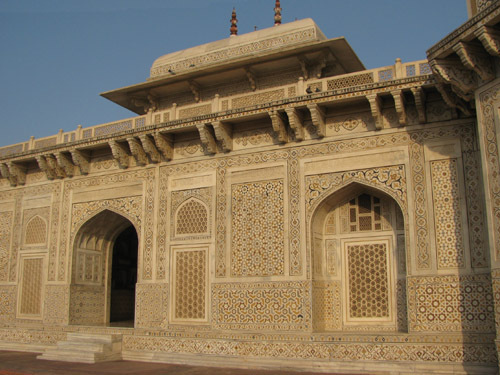 There was a much darker side to Shah Jahan’s life, including such discord with his father that led to a civil war. He had his brother, uncle and two male cousins murdered so he would accede to the throne unhindered. At the foot of the stairs leading up to the plinth (the platform upon which the Taj Mahal is built), you must either take off your shoes or you can put on disposable shoe covers. The day I was there, people were only being allowed inside one room, which had nothing of interest. I did not see the room where the tombs were. 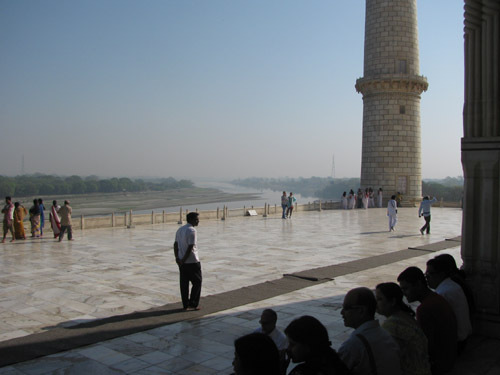 The Yamuna River flows to the rear of the Taj Mahal. Visitors resting at the side of the Taj Mahal. 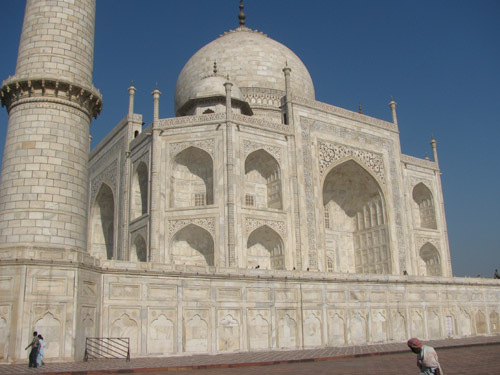 Shah Jahan’s life ended, imprisoned by his eldest son, in a cell across the Yamuna from which he could look upon the incredible white marble monument for his favorite wife that took him 20 years to build, a monument that over two million people visit each year over 350 years later. 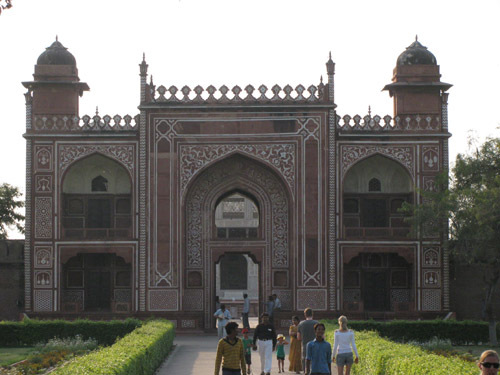 Fatehpur Sikri was very close to Agra. After checking in to the hotel, I had lunch. The hotel didn’t have parking or driver’s facilities, so Prem had to stay elsewhere. He was to pick me up for a little sightseeing later in the afternoon when it wasn’t so hot. 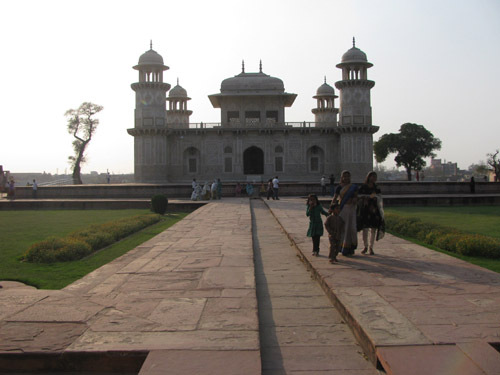 I wanted to see the tomb of Itimad ud Daulah. 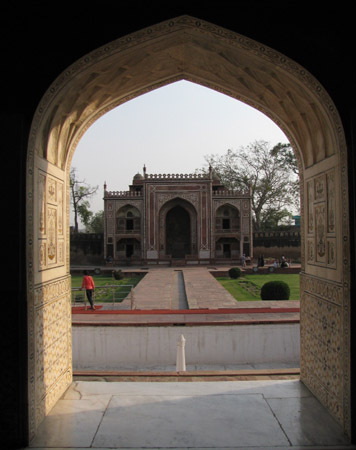 Mughal mausoleums all seem to have been built on the same plan. There was an elaborate gate at the entrance. 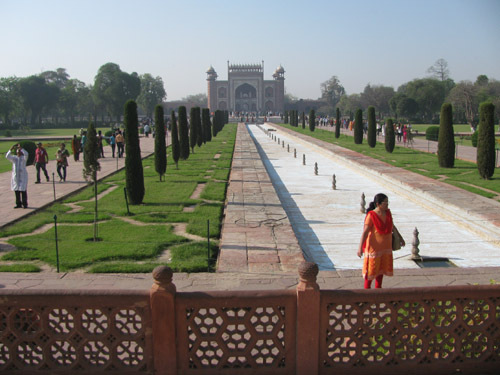 The tomb was built at the center with gardens surrounding it, and it was flanked by identical buildings on each side. 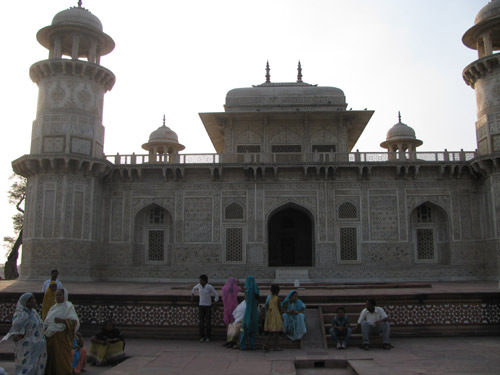 The tomb is also known as the Baby Taj, but it was built between 1622 and 1628, a decade before the Taj Mahal. 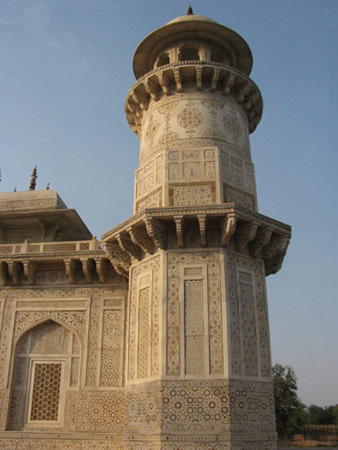 Itimad ud Daulah (pillar of the state) was the title of Mirzā Ghiyās Beg, the grandfather of Mumtaz Mahal, the third wife of Shah Jahan, who built the Taj Mahal. 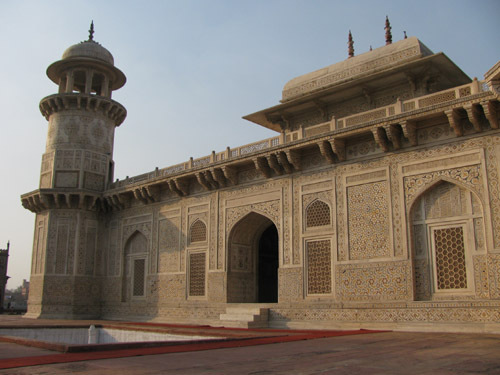 Mirzā Ghiyās Beg was the treasurer of Emperor Jahangir, who ruled just prior to Shah Jahan. This building and another identical one were on either side of the mausoleum. There was a third building directly behind the mausoleum. 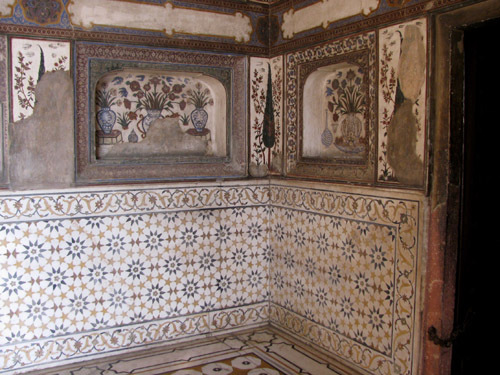 This tomb is distinctive because it was the first time white marble had been used for a Mughal mausoleum. 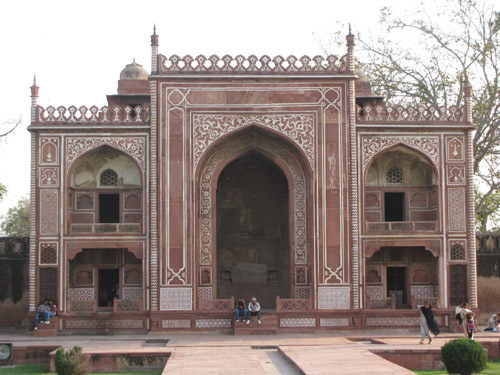 Up until then, red sandstone had been the favorite material, as had been used in the Red Fort and Humayun’s Tomb. 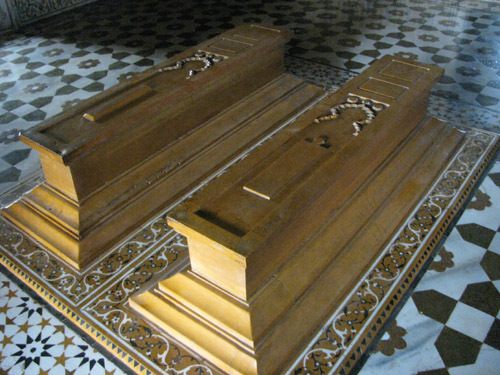 The tomb represents a jewel box. This was a very enjoyable visit. It was small, and no guide was needed. It apparently wasn’t very heavily visited, as no touts were around. My bad luck, all the water features were empty. 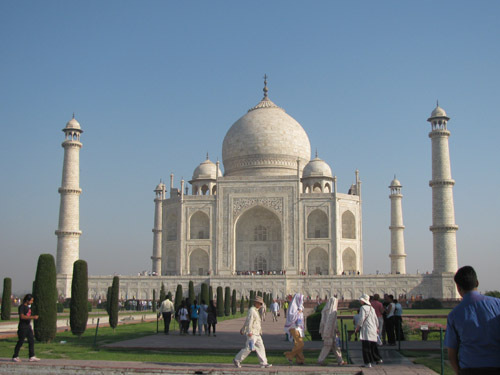 This entry was posted on September 19, 2011, in Agra, India, Rajasthan.